Queensland batsmen Joe Burns and Usman Khawaja have been recalled by Australia for the first two Tests of their series against New Zealand. Burns, 26, will open the batting with David Warner following the retirement of Chris Rogers, 38. 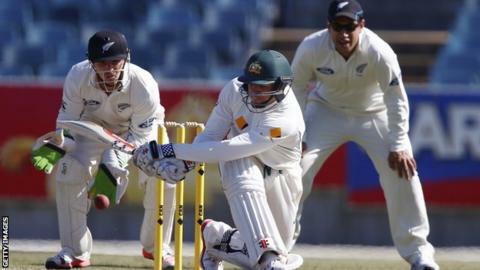 Australia's bowling attack is unchanged from their Ashes defeat to England. Kiwi preparations for the first Test in Brisbane were disrupted after their warm-up match in Sydney was abandoned because of the state of the pitch. Burns, who has won two Test caps, was preferred to Western Australia's Cameron Bancroft, while Queensland captain Khawaja, 28, got the nod ahead of Shaun Marsh, who played one Test against England in the summer. Chief selector Rod Marsh said: "Usman is a very good player of fast-bowling and is a fine technician. We feel he will make a really solid contribution towards our batting this series. "Joe thoroughly deserves his chance and was unlucky to miss out on the West Indies and Ashes tours off the back of two decent performances in his last Test match for Australia." As well as the departure of Rogers, Australia can no longer call on the retired pair of all-rounder Shane Watson and former captain Michael Clarke for the three-match series against New Zealand, which starts at the Gabba in Brisbane on Thursday, 5 November. Australia squad for first two Tests: Steve Smith (capt), David Warner (vice-capt), Joe Burns, Josh Hazlewood, Usman Khawaja, Mitchell Johnson, Nathan Lyon, Mitchell Marsh, Peter Nevill (wk), Mitchell Starc, Peter Siddle, Adam Voges.